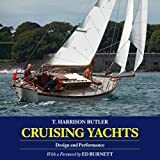 Dr Thomas Harrison Butler was a skilled, yet amateur, designer responsible for some hundreds of classic English cruising yachts which still grace our seas. Cruising Yachts, his design manifesto, first appeared in 1945-the year of his death-and last appeared in print in 1995. This long overdue Fifth Edition has been produced in collaboration with the Harrison Butler Association, and is a complete re-setting of the original text, drawings and mono photographs, documenting in detail HB's approach to the design and equipping of a yacht, providing an annotated catalogue of notable designs, and including a biographical portrait by HB's daughter, the late Joan Jardine-Brown. New for this edition are a modern gallery of colour photographs of HB yachts, and a thoughtful and illuminating Foreword by Ed Burnett, one of today's foremost designers of yachts in the classic English idiom.